This study investigates perceptions of state and private school EFL teachers towards professional development. It focuses on interpreting the concept of professional development, putting emphasis on different perceptions of teachers working in different types of schools as well as gender and age factors in order to shed light on the current issues of teacher development. 45 state and 45 private school EFL teachers were involved in data collection procedure. A 16-item Likert questionnaire was administered and outcomes were interpreted statistically. Results of the study indicate that all teachers involved in the study perceived professional development topics very positively especially towards life-long and ongoing professional development and belief in themselves and their profession. When private and state school teachers are compared, private school EFL teachers are more concerned about some principles of professional development in teaching than state school EFL teachers. Gender has an effect to some extend on teachers’ perceptions of professional development in favour of female EFL teachers whereas age is not a decisive factor on their perceptions. Alfaki, I. M.(2014). Professional development in English Language Teaching: A teachers’ view. British Journal of Education, 2(7), 32-49. Alibakhshi, G., & Dehvari, N. (2015). EFL teachers’ perceptions of continuing professional de¬velopment: A case of Iranian high school teachers. PROFILE Issues in Teachers’ Professional Development, 17(2), 29-42. http://dx.doi.org/10.15446/profile.v17n2.44374. Atay, D. (2008). Teacher research for professional development. ELT Journal, 2(62), 139-147. Caena, F. (2011). Literature review: quality in teachers’ continuing professional development. European Commission Thematic Working Group ‘Professional Development of Teachers’(Brussels, European Commission). Retreived on 10 May 2016 from eu/education/policy/strategic-framework/doc/teacher-development_en. Pdf. Çelik, S. , Macianskiene, N. and Aytın, K. (2013). Turkish and Lithuanian EFL instructors' professional development experiences: worth the effort, or waste of time? Erzincan University Journal of Education Faculty, 15(2), 160-187. De Bary, W. T. (2007). Confucian tradition and global education. Columbia University Press. Diaz-Maggioli, G. (2003) Professional development for language teachers. Eric Digest, 03-03. Retrieved on 20 April 2016 from http://unitus.org/FULL/0303diaz.pdf. Doku, P. N., & Asante, K. O. (2011). Identity: globalization, culture and psychological functioning. International Journal of Human Sciences, 8(2), 1-8. Karahan, F. (2007) Language attitudes of Turkish students towards the English language and its use in Turkish context. Journal of Arts and Sciences, 7, 73-87. Kirkgoz, Y. (2007) English language teaching in turkey policy changes and their implementations. RELC Journal, 38(2), 216-228. Kizildag, A. (2009) Teaching English in Turkey: Dialogues with teachers about the challenges in public primary schools. International Electronic Journal of Elementary Education, 1(3), 188-201. Lord, B. (1994) Teachers’ professional development: Critical colleagueship and the role of professional communities. In The future of education: perspectives on national standards in education Cobb N. (Ed.) New York NY: College Entrance Examination Board, pp. 175–204. Korkmazgil, S. and Seferoğlu, G. (2013). Exploring non-native English teachers professional development practices. 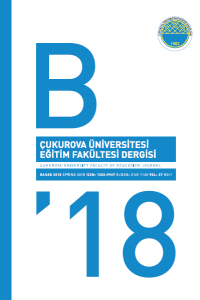 Boğaziçi University Journal of Education, 30(1). Retrieved on 25 September 2016 from: http://dergipark.ulakbim.gov.tr/buje/article/view/5000140041. Mahmoudu, F. and Özkan, Y. (2015). Exploring experienced and novice teachers’ perceptions about professional development activities. Procedia - Social and Behavioral Sciences, 199 57 – 64. McNeil, L., & Valenzuela, A. (2000). The harmful impact of the TAAS system of testing in Texas: Beneath the accountability rhetoric. Retrieved on 10 May 2016 from http://files.eric.ed.gov/fulltext/ED443872.pdf. Mizell, H. (2010). Why professional development matters. Learning Forward:NJ. Peña-López, I. (2009). Creating effective teaching and learning environments: First results from TALIS. OECD 2009. Retrieved on 1 June 2016 from https://www.oecd.org/edu/school/43023606.pdf. Sherman, R., Tibbetts, J., & Condelli, L. (1997). Evaluating professional development: A framework for adult education. Pelavin Research Institute. Simegn, B. (2014). EFL teachers’ self-initiated professional development: perceptions and practices. Educational Research and Reviews, 9(21), 1109-1114. DOI:10.5897/ERR2014.1898. Tılfarlıoğlu, F. Y. (2011). An international dimension of the student's attitudes towards the use of English in web 2.0 technology. Turkish Online Journal of Educational Technology, 10(3), 63-68. TALIS, 2009. OECD Teaching and Learning International Survey the Experience of New Teachers. Retrieved on 10 May 2016 from https://www.oecd.org/edu/school/43023606.pdf. TALIS, 2013. OECD Teaching and Learning International Survey: Conceptual framework. Retrieved on 4 August 2016 from http://www.oecd.org/edu/school/TALIS%202013%20Conceptual%20Framework.pdf. Uysal, H. (2012). Evaluation of an in-service training program for primary-school language teachers in Turkey. Australian Journal of Teacher Education, 37(7), 13-29. ISNAD Babanoğlu, M. Pınar , Yardımcı, Aylin . "Turkish State And Private School EFL Teachers’ Perceptions on Professional Development". Cukurova University Faculty of Education Journal 46 / 2 (September 2017): 789-803.